Look for some peace and quiet? Then stop looking! 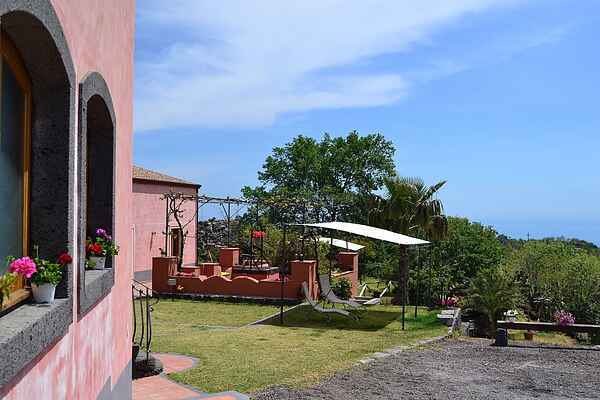 This characteristic holiday home on the slope of the Etna is a beautiful and rustic, Sicilian farmhouse, consisting of 2 comfortable attached apartments with air conditioning and a restaurant. You will receive a warm welcome from the young couple who will try to make your stay as perfect as possible. They will provide you with tips and all the information you need; this way you won't have to miss a single spot in this beautiful area of Sicily. Thanks to the very strategic location of this apartment, you'll certainly take many trips to the most beautiful natural and cultural spots, as well as culinary highlights. You can visit the recent lava streams and lava caves, charming villages, the coastal towns of Catania and Taormina, the mountain cliffs of the Alcantara and much more. After a day of fun you can nicely unwind in your wonderful apartment. But you can also use the restaurant on the property, where the hostess will prepare the most delicious meals for you. Besides having your breakfast in the restaurant (for a fee), you can also choose to have breakfast delivered to your room. More luxury is hardly possible! Enjoy the delicious meals in the restaurant. Open for lunch on Saturdays and Sundays and dinner Tuesday to Sunday.